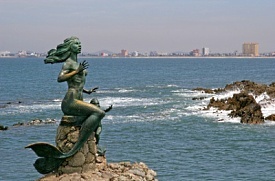 Mazatlan is the sportfishing capital of the world. As the ship pulls into harbor, passengers will catch sight of the El Faro lighthouse, the second-tallest lighthouse in the world. The most popular excursions are city tours that visit the main square, the historic district and the beaches, and an all-day tour to the Sierra Madre mountains to see the villages of Concordia and Copola.